VW's Poetsch addresses the company's annual shareholder meeting. HANOVER, Germany -- Volkswagen Group will not publish a final report with the conclusions of an external investigation into its diesel emissions scandal conducted by U.S. law firm Jones Day. Addressing 3,000 shareholders at the carmaker’s annual general meeting here Wednesday, VW Chairman Hans Dieter Poetsch praised the Jones Day probe as "one of the most comprehensive in German corporate history" but said VW would risk heavy fines and potentially more lawsuits if it agreed to the demands. "I’m aware that some of you wish for greater transparency. Often the publishing of a full report is demanded,” Poetsch said. "To be clear: there is no written final report from Jones Day, nor will there be. I ask for your understanding that for legal reasons Volkswagen is prevented from publishing any such report." Poetsch said VW would risk “massive fines" if the report were published. Despite the automaker's settlement with the U.S. Department of Justice, there are many civil litigation cases were ongoing and official investigations still pending. VW's plea deal with the U.S. government prevents it from deviating from the official conclusions published by the Department of Justice in a so-called "Statement of Facts." Investors at the meeting were unhappy with the explanation and continued to press for the report to be published. Investment advisory firm Hermes EOS said disclosing the report's findings would allow VW to move on from its biggest-ever corporate crisis. Hermes representative Hans-Christoph Hirt said the statement of facts is no replacement for a full report. "That is the only way to win back lost confidence," he said. 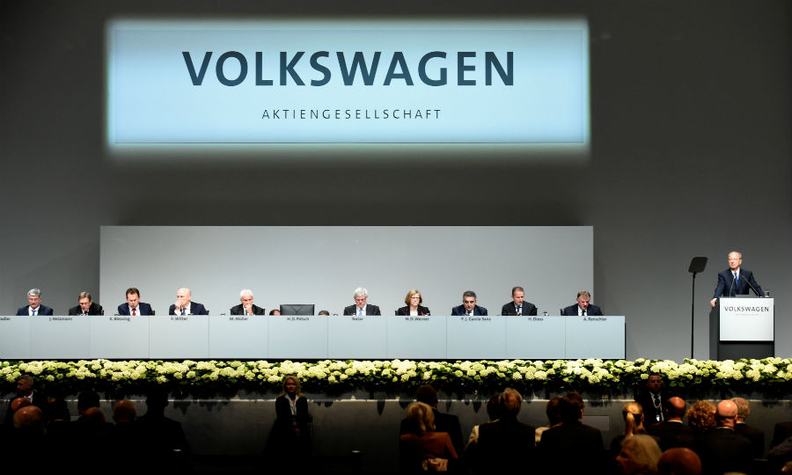 Christian Strenger, a shareholder rights advocate and German corporate governance expert, demanded that management and directors "put all their cards on the table," since there is a legal back door that explicitly allows VW the option of publishing new information. "Under the plea agreement, the U.S. has a right to see any findings and agree to them in advance," he said. "Your reference to the statement of facts agreed in the U.S. is completely insufficient and almost insulting to all those who are interested in complete clarification of responsibilities," said Strenger, a supervisory board member at DWS Deutsche Asset Management. Just after the scandal erupted in 2015, VW pledged to inform shareholders about the findings of the Jones Day report, which was used as the basis for a $4.3 billion settlement with the Justice Department. CEO Matthias Mueller said VW would support" without reservation" Larry Thompson, a former U.S. deputy attorney general, who has been picked by the Justice Department to oversee the company for three years. Thompson and his team will have access to VW documents and assess the efforts of its board of management and senior management to comply with environmental laws. In total, VW has agreed to spend up to $25 billion in the U.S. to address claims from owners, environmental regulators, states and dealers and offered to buy back about 500,000 polluting vehicles in the market. "I see this as an opportunity," Mueller said. "The work of the monitor can and will contribute to bringing risk management, compliance and integrity within the group to new levels."